Easily one of the most recognizable helmet brands of the last three decades, Arai is the brand that everyone wants when it comes to helmet choice. Obviously there are other brands to choose from, but in terms of popularity, Arai is number one. Though the shell shapes and model designs share a lot of features, it’s the RX-7 that has always been the Arai of choice. New for 2015 is this, the RX-7V. At this stage, there’s little point us doing more than giving you the information we have direct from Arai. We’ve got a review model on the way and will (as usual) bag at least a 1000 miles before we write anything about the performance of the helmet. Sit back and feast yourself on the tech specs and history behind the project. The RX-7V represents the summit of Arai’s knowledge, experience and know-how in helmet technology. With a completely new PB-SNC² outer shell, the revolutionary VAS (“Variable Axis System”) visor system and a significant increased smoother area around the temples, the RX-7V offers the new benchmark in the premium helmet segment. From the also new Eco Pure liner with an even slimmer frame, to the new ducts, improved diffuser and the integrated Air Channels, every part shows the attention to detail that is so typical for Arai. 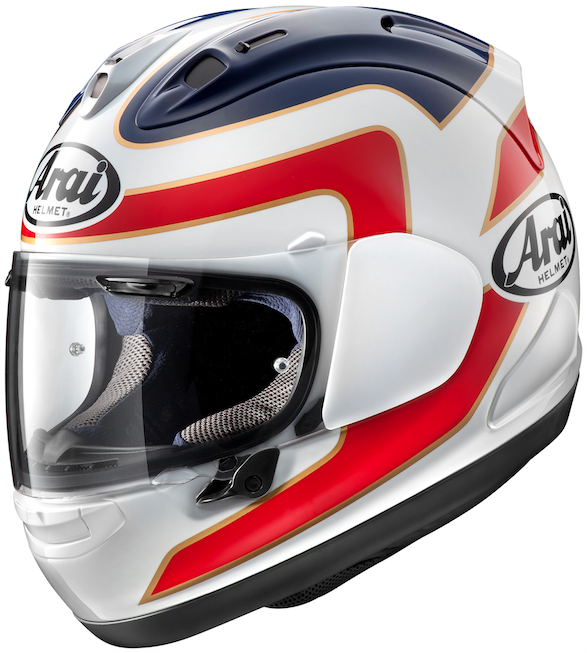 Arai has continually improved the “glancing off” performance by learning from real scenarios. Thanks to the new stronger and smoother shell and VAS, the RX-7V is closer to the ideal helmet shape than ever. In any helmet, regardless of brand, the amount of energy that can be absorbed is limited. 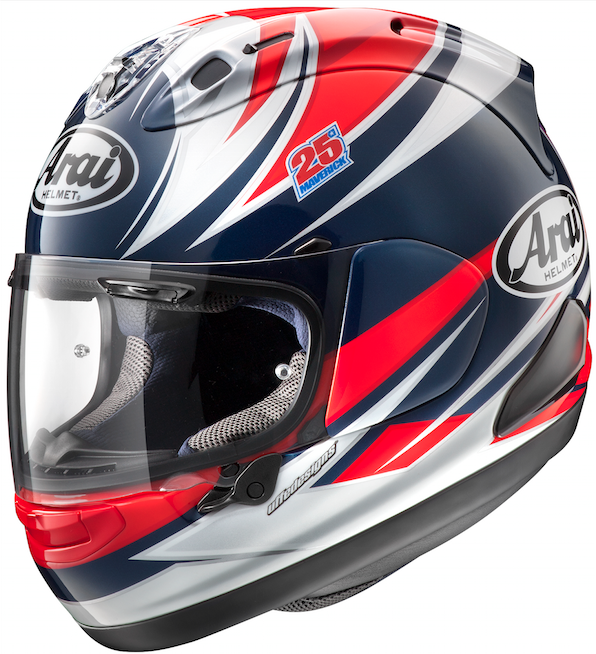 Throughout our long history, Arai has continually improved the “Glancing off” performance by learning from real cases. Therefore, avoiding potential impact energy by glancing off should also be a key function of a helmet. So we have been pursuing a sleek shape that is more likely to glance off energy. Most shield mounting systems require indents with a high pivot point in the shell, even Arai, so as to open and close the shield. On the new “VAS”, the mounting position was lowered 24mm in pursuit of the ideal smoother shape that increases the ability of glancing off energy. As a result, this has made it possible for the shell to be completely smooth above the test line of the Snell standard. The new outer shell design continues to benefit from that focus and delivers Arai’s smoothest shell shape. The benefit is to improve glancing off ability. VAS lowers the visor holder, and therefor lowers the visor mechanism below the test line, allowing for a smoother shell and better impact performance. In any helmet, regardless of brand, the amount of energy that can be absorbed is limited. Therefore, avoiding potential impact energy by glancing off should also be a key function of a helmet. So we have been pursuing a sleek shape that is more likely to glance off energy. Most shield mounting systems require indents with a high pivot point in the shell, even Arai, so as to open and close the shield. On the new “VAS”, the mounting position was lowered 24mm in pursuit of the ideal smoother shape that increases the ability of glancing off energy. As a result, this has made it possible for the shell to be completely smooth above the test line of the Snell standard. VAS allows the shield to travel in an arc, allowing a lower and more compact visor mechanism. This not only improves helmet performance for enhance rider protection but also allows easier shield changes with more intuitive design. We use a net structure core, assembled and bonded within Super Fiber and other special synthetic fibers. These special fibers are also used for the visor panel of F-1 helmets and have superb characteristics in tensile strength and flexibility. Our shells are carefully molded with multiple material layers including a Super Fiber belt across the helmet, just above the visor opening for extra strength. We have also developed a new resin in pursuit of a lightweight but very strong shell. This new resin improves adhesiveness between each layer of fiber for a stronger outer shell. It also offer approximately 30g weight saving. Thinner frame materials and redesigned frame connection points make the latest interior comfort head liner even more comfortable. Stress joints allow the liner to flex and even separate in necessary so as to not interfere with the helmets impact energy management properties/performance. The result if this new design outer shell, is that there is now almost also 3mm of extra face/chin room. 1967 The worldwide motorcycle community is astonished by the arrival of a completely new style of helmet the ‘’full face’’ helmet, also called ‘’integral’’ helmet. 1968 Arai introduces its very first full face helmet. An expensive helmet as a standard open face jet helmet sold for 3.200 Japanese yen, an open face racing helmet was 6.900 yen and the full face sold for 25.000 yen. 1978 RX-7 cLc was released. 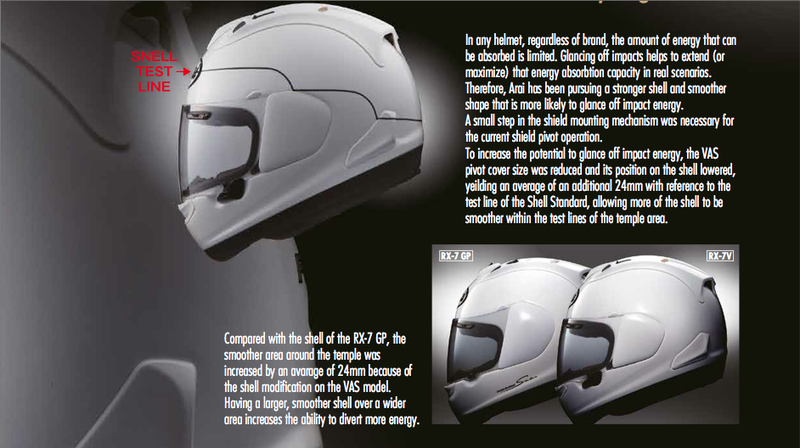 The ‘’cLc sandwich construction’’ for the outer shell increased strength and reduced helmet weight dramatically. First use of Super Fiber material. The result was a helmet weight of 1.400 grams where the competition weighted 1.700 grams. 1981 Introduction of the Omni model with the world premiere of the now familiar ‘’holder system’’ for the visor mechanism. This holder system makes changing and adjusting the visor so much easier. 1982 New RX-7 with the new holder system. 1988 World premiere of the ‘’AdSis’’ visor system. This allow tool less changing of the visor in a matter of seconds. 2008 Introduction of the RX-7 GP in Barcelona. First helmet with the advanced, adjustable ‘’Air Wing’’ concept. 2015 Introduction of the completely new RX-7V with the VAS (‘’Variable Axis System’’) visor mechanism offering an increased smooth outer shell area for better glancing off ability. The combined ventilation systems offer excellent and efficient ventilation. The new top duct provides 11% more airflow, with bigger switches for effortless operating. The Air Channel guides air from the eye port area to the side ducts. The new diffuser is 20 mm longer with improved aerodynamics, and 19% larger intake scoops, both work together with the Air Wing to improve stability. The chin cover blocks air intrusion and draws more air from the mouth area. Larger front intakes with intake shutters that better seal for a more aerodynamic effect when closed. Trailing sides of the diffuser body streamline the airflow to improve stability, drag and wind noise. The new chin vent offers a dual pivot design, offering options to shield defogging or rider comfort. The vent is now also easily removable/replaceable via a single screw accessible from the front. The RX-7V also features new neck roll exhaust vents to improve flow volume and efficiency with addition intakes port for better flow through. Flexibility of the neck roll is also improved for easy wearing/put on. The exclusive and patented Arai AirWing® function has been improved due to being approximately 20mm farther back, a result of the longer diffusers. The diffusers also have a lower profile at the rear. Compared to the previous “Type 10” diffusers, the efficiency of the new “Type 12” diffusers have increased by 19%! The new air intake vents now have more adjustability with three positions of closed, half open and fully open. These new vents are not only easy to use with gloves, they also have improved sealing that decreases wind noise and water intrusion. Borrowed from our F1 helmet, completely modified 3D moving new shield lock mechanism secures the shield like never before, but operates smoothly with an intuitive fluid – one finger operation – even with gloves. The unlock lever on the VAS visor holder makes removing the shield easier and faster. Reliability of the shield is also increased with the VAS feature. The new shield-latching lever has a positive mechanism that performs better against shock and is easier to use with gloves. This lever also has an anti-fog position. The fully removable interior liner system has been improved with our new blue Eco-Pure material, which maintains a balanced pH. It also has antibacterial and deodorizing properties. With the aim of improving comfort we have developed a new softer liner frame material. The new liner also has adjustable padding thickness that allows a customized fit. Prices start from £599.99. Expect to see the helmet on sale later this year.